As I am sitting here waiting for the plane to leave I am thinking to myself... Where is my Bloody Mary? Hoo (short for Houdini) and I are on our first retreat as a new couple. His bright teal frame and sturdy exterior made him a perfect purchase and buddy for my future gallivanting around the world. For many years I used a backpack I purchased in 2000. It was for my first trip to Europe with my Girl Scout troop. We had decided that backpacks with wheels and zip off day packs were our best bet. I bought that backpack and ever since then it has been my trusty companion all over the world. There are scars from being checked, torn nylon, water stains and broken wheels, but this little guy was a trooper until as with most things in life it was time to get replaced by a younger more vibrant version. For my trip to Mexico and because of skyrocketing check baggage fees, I needed a smaller condensed version of my trusty Kelty backpack. I wanted one that didn't have wheels, fit on my back comfortably and was fair priced. It had to have good reviews, be VERY durable and preferably come in a color that's not black. You know who you are: people at the baggage claim that check every black bags tag to make sure it isn't yours. I bought Hoo on ebags.com after reading several reviews and comments. This bag was suppose to fit in most overhead bins and be expandable with all sorts of pockets and organizational panels. Lets put it this way: this bag has the potential to make me one very happy Kelly Kelly. Organized? Brightly colored? No wheels? Extra tough materials? Yes please! I forked over the $80 on it and took a chance. The organizational pockets are excellent. There is an easy access pocket for liquids, laptop, and any other organizational needs you have. The straps are removable! So, if I don't want it to be a backpack, it doesn't have to be! It's an appropriate size. This pack would be super easy to over pack, but also keeps you from packing too much. 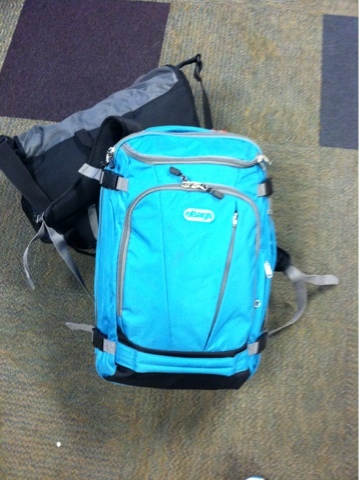 It is expandable, however, unless you are using that on your back from your trip--you shouldn't use it anyway. This bag is perfectly check-able and will fit into any overhead bin. Let me reiterate: this bag will fit into any overhead bin even if it is expanded. 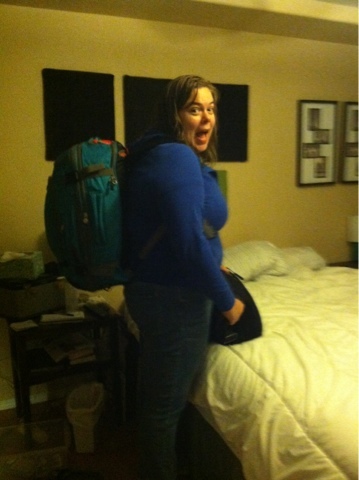 Done are the days where you have to unpack your entire bag just to make that one last squeeze. Hoo is truly magical (pun intended) and I know that I will enjoy traveling with him. And here we are. The beginning of a love story and many happy years of traveling. Kelly Kelly at 4am ready to catch her plane.